Combining durability, security and style, Peli Hardback cases have been introduced to protect iPads, tablets and laptops from drops, knocks and scratches no matter where you go. Hardback cases are manufactured in tough ABS, offering robust and durable protection, even in extreme conditions. Peli Backpacks combine the watertight features of the Peli case with a practical, stylish backpack. This new Peli range offers an ideal solution to protect technology and photographic gear whilst on the move. The range is designed for function with flair and includes different styles to protect laptops or tablets - these are top loading for fast access. 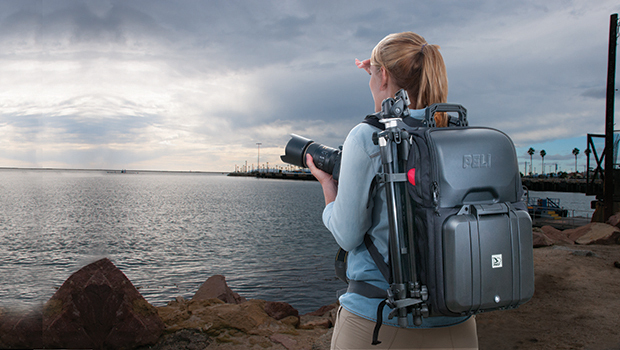 The new Peli U160 and the S115 Camera Backpacks include a crushproof section for cameras and lenses. There are cushioned dividers to protect each piece of camera kit from knocking against another. These dividers can be moved and reconfigured to accommodate changes in the equipment carried. As an award winning documentary television cameraman with a reputation for filming in some of the world's most challenging and hostile environments, Jonathan Young has trusted his valuable camera kit to Peli since 1996. I go to tough places. I work with tough people. I find myself in tight spots all the time. Often the only thing I know I am sure about is how I am going to protect my equipment. Peli cases. Period. Right up to the time I fly, decisions about which camera format to shoot on, where we are actually going and who we are actually filming with constantly fill my inbox and voicemail. Not so when I come to transporting and protecting my equipment, the choice is already made.... Peli cases. I went to Papua New Guinea with TV presenter Ross Kemp for his "Extreme World' series . PNG lives up to and exceeds the title of the programme. Just getting there via air takes two days. Once there, the appalling roads are only passable via 4x4 and then only some of the time due to landslides. The country is in the grip of change but this upheaval has added to the existing tribal issues that plague PNG. Ross and I went to meet the perpetrators of this violence first hand, placing ourselves at great personal risk. To cover such events, you have to have your wits about you and put faith in your gear not letting you down after being literally thrown around in the back of a of 4x4 for a day's travel. With Peli protecting my kit, I never doubted for a minute, I couldn't just pick up the camera and cover the unfolding events in front of us. We were held up at gunpoint on camera; the image that has been transmitted around the world just wouldn't have been possible without Peli protecting my kit. Rob Wick from Polecat Cameras has toured with many large and small bands operating cameras whenever a handheld, pedestal or long lens camera operator is required. 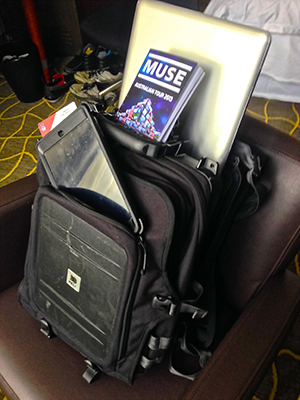 Rob Wick has just completed a global tour with the band Muse where in addition to his Peli cases, he used a Peli U100 Backpack. I have been touring within the entertainment business for many years. I have gone through my fair share of bags, luggage and backpacks. My Peli Urban Elite Backpack has been with me now for six months and it has taken the battering of airport security and general touring wear and tear very well. I would say from my entire past luggage experiences this has proven itself a winner. The quick release makes it easy for laptop access at airport security. The front pocket is great for the iPad (other tablets are available) and the top pocket is a great place for passport and tickets. I love this backpack and will continue to use it for many years to come.